What is the condition seen in this cat? 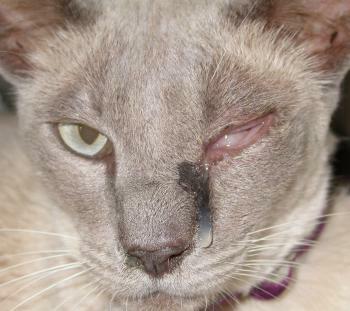 What infectious agents might be causing the lesions in this 8 year old cat’s eyes? How would you differentiate betwen the two? 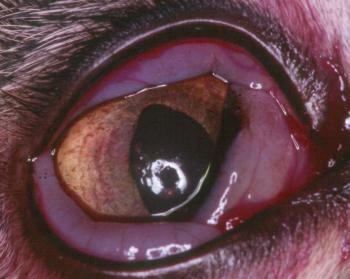 The cat has conjunctivitis with chemosis or conjunctival oedema. The condition may be associated with Chlamydophila infection or with feline herpesvirus. Differentiating between the two is impossible by simple clinical examination of a cat such as this. A swab for polmerase chain reaction of viral or chlamydial DNA is the best method. If finances do not allow for such a test, treatment with chlortetracycline can be diagnostic; if the condition improves markedly the disaese is most likely to be chlamydial, while otherwise FHV-1 must be the more likely candidate. This entry was posted in Cases and tagged cat, chemosis, conjunctivitis. Bookmark the permalink.